Two men were taken off a flight bound for Manchester after some passengers became alarmed about what they regarded as suspicious behaviour. People on the Airbus 320 at Malaga alerted staff and demanded their removal, Monarch Airlines said. The pair were subsequently taken from flight ZB 613, carrying 150 passengers and seven crew, early on Wednesday. Two men, reported to be of Asian or Middle Eastern appearance, were questioned for several hours. Authorities allowed them to fly back to the UK later in the week. 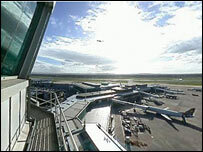 The plane had been due to take off about 0300 BST but was delayed by about three hours. A spokesman for Monarch Airlines said: "There were two passengers on the flight who came to the attention of the other people because they were apparently acting suspiciously. "The flight attendants were sufficiently concerned to alert the crew who in turn informed the security authorities at Malaga airport." No details of their "suspicious" behaviour were revealed. The Conservative homeland security spokesman, Patrick Mercer, described the incident as "a victory for terrorists". "These people on the flight have been terrorised into behaving irrationally," he told the Mail on Sunday. "For those unfortunate two men to be victimised because of the colour of their skin is just nonsense." Aviation expert David Learmont said "paranoia" among passengers had increased since UK officials said they had thwarted an alleged plot to blow up planes mid-flight but he believed it would calm down. "There is a problem here - if people get too paranoid because someone is sweating and sitting white-knuckled because they are afraid of flying, then other passengers sitting nearby are going to think that they're about to explode a bomb. "But how can you stop it? People should keep an eye out for suspicious behaviour but nervousness is not enough." He said a heightened state of alertness was being encouraged by the media, although there had been cases of genuine concern on flights. "We are in a paranoid time, but vigilance by ordinary people is important."